The Meadowbrook Farm Park is the perfect location for weddings, family reunions, business retreats and social events. Your guests wil enjoy the spectacular view of Mt. Si and the serenity of the Snoqualmie Valley. Nestled on historical Meadowbrook Farm, the center boasts a natural log interior with large barn-style sliding doors providing the option for open air events. The Meadowbrook Farm Park accommodates 75 or more guests depending on your arrangement. The professional staff at Si View Metro Parks are pleased to assist you in planning your next event at Meadowbrook Farm. 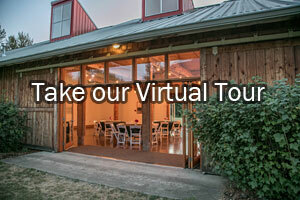 Please call for a personal tour of the Meadowbrook Farm Park. Meadowbrook Farm Park Web site!